The majority of creatures are represented here, each having a specific reason for its inclusion (also most of them being on the cheap side to keep us under budget). Creatures have power 2 or less but also have a great upside and most of them cost more than 2 CMC, so cheating them into play makes them that much better. Utilizing cards like Ravenous Chupacabra and Fleshbag Marauder eliminate threats on the opponent’s board. You’ll create tokens with Siege-Gang Commander, Pentavus and Noosegraf Mob. Tree of Perdition is a great tool to slow down lifegain decks, while the Priests of Gix and Urabrask along with Palladium Myr will help speed us up. There are some combo pieces too, with Triskelion and Workhorse being able to go infinite by giving them Undying (and no, you don’t need Mikaeus to do it — he’d break the budget). You’ll be cheating in creatures for 2 mana a pop very quickly with Grenzo, so we’ll want the rest of our supporting cards to help manipulate our libraries. This means ways to put cards on the bottom of our library from our graveyard, or from the top to bottom with heavy use of the Scry keyword. As you can see, we’re going to be manipulating our deck quite a bit. This is done by using artifacts and creatures that allow us to move cards from our graveyard to the bottom of our library. Example: Cast your Nekrataal, killing an opponent’s creature, then sacrifice it to Viscera Seer putting it into your graveyard, then use any of our cards that has the ability to put Nekrataal back on the bottom of the library, then put him back onto the battlefield with Grenzo’s ability. You can exploit cards over and over again in this manner. You’ll also be able to use cards like Faithless Looting or Tormenting Voice to draw cards and discard cards you’ll want to put onto the bottom of your library with the above method. You can scry at will with many of the artifacts I’ve included, so use this ability often to set up Grenzo in the best way possible. 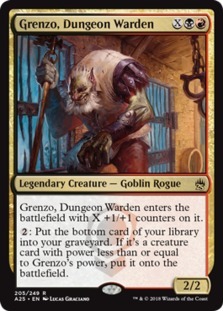 Another way we can churn through our libraries is with cards like Teferi’s Puzzlebox and Mindmoil, drawing a ton of cards and being able to set up your Grenzo uses in the process. The biggest benefit is that Grenzo doesn’t need to be tapped to use his ability, and this also means you can respond at instant speed. For example, if it’s an opponent’s turn and your Crystal Ball is untapped (you’ll need 3 untapped mana as well, so you should probably leave mana up each turn if possible) and they cast a big bad creature that is going to hit you you can tap a land for mana, tap Crystal Ball to scry 2, putting a response on the bottom of your library (say a Chupacabra) and then activating Grenzo to put that creature onto the battlefield and killing the enemy’s threat. Of course Scrying doesn’t necessarily mean you’ll get what you need, but having a response is better than not, and you could also use your ability to move cards from graveyard to bottom of library to get the answers you need. You can literally move cards from zone to zone at will, so you might as well take advantage of it! With that said, there really isn’t a baked in win-con here. You’ll have a sort of toolbox style game plan, wanting to manipulate Grenzo and the abilities I’ve described to lock down the board and get your chip damage in. Of course this won’t be a high tier build of Grenzo, but still looks like a fun deck to pilot for a small investment! You can see the full decklist here.